If you have been hanging around these parts for a while, then you know that I'm a big fan of Kay Kenyon's The Entire and the Rose science fiction series. If you haven't given Bright of the Sky (Canada, USA, Europe), A World Too Near (Canada, USA, Europe), City Without End (Canada, USA, Europe), and Prince of Storms (Canada, USA, Europe) a shot yet, you need to put them on your wishlist ASAP! 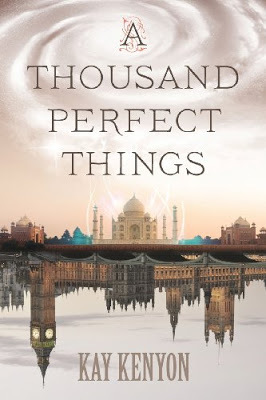 Hence, when the author's new publisher got in touch with me to inquire whether or not I'd be willing to read and review A Thousand Perfect Things, of course I agreed! I was curious to see if Kenyon could somehow imbue a stand-alone work with as much magic and wonder as her latest series. Kay Kenyon's The Empire and the Rose was hailed as "a star-maker", "a magnificent book", "audacious", and "the most ambitious science fiction epic of the current decade", garnering starred reviews and comparisons to Larry Nivens and Stephen R. Donaldson. To claim the powers of the legendary golden lotus, Tori Harding, a Victorian woman, must journey to Bharata, with its magics, intrigues and ghosts, to claim her fate, and face a choice between two suitors and two irreconcilable realms. It is 1857. After millennia of seafaring, and harried by the kraken of the deep, in a monumental feat of engineering Anglica has built a stupendous bridge to Bharata. Bharata's magical powers are despised as superstition, but its diamonds and cotton are eagerly exploited by Anglic colonials. Seething with unrest over its subjugation, Bharata strikes back with bloody acts of magical terrorism. Despite these savage attacks, young Tori Harding yearns to know if Bharata's magics may also be a path to scientific discovery. Tori's parents hold little hope for her future because she has a club foot. Therefore they indulge her wish to have instruction in science from her famous botanist grandfather, even though, as a woman she will be denied a career in science by the male-dominated scientific societies. Though courted by a friend of the family, Captain Edmond Muir-Smith, Tori has taken to heart her grandfather's warning not to exchange science for "married slavery." Emboldened by her grandfather's final whispered secret of a magical lotus, Tori crosses the great bridge with her father's regiment and Captain Muir-Smith. In Bharata she encounters her grandfather's old ally, the Rana of Kathore, his rival sons, and the ancient museum of Gangadhar, fallen to ruin and patrolled by ghosts. In pursuit of the golden lotus, Tori finds herself in a magic-infused world of silver tigers, demon birds and the enduring gods of Bharata. As a great native mutiny sweeps up the Rana's household, her father's regiment and the entire continent of Bharata--Tori will find the thing she most desires, less perfect than she had hoped, and stranger than she could have dreamed. The worldbuilding is, sadly, a bit generic. The alternate history versions of 19th century England and India are somewhat déjà vu and don't capture the imagination the way various locales and concepts did in The Entire and the Rose. That was a disappointment, for the inventive worldbuilding was definitely one of the most captivating aspects of the series. I believe that the strictures inherent to the writing of a stand-alone novel precluded the sort of depth that made The Entire and the Rose so special. Mind you, I'm not saying that there is no depth to A Thousand Perfect Things. Far from it. It's just that the limited page count appears to have prevented Kay Kenyon from opening up and from writing a more sprawling and evocative narrative. As a result, the themes and the concepts often feel quite underdeveloped, which in turn robs many of them of the anticipated sense of magic and wonder we have come to expect from the author. The characterization also leaves a little to be desired. For some reason, I was unable to connect with any of the protagonists. Which, understandably, made it a bit difficult to maintain interest throughout the book. Tori Harding feels more than a little clichéd, although I must admit that Kenyon has a few surprises up her sleeve where her main character is concerned. In Bharata, Jai, Mahindra, and Dulal are interesting in their own ways, yet they fail to truly convey all the magic and intrigue of the exotic continent and its people. And even when the POV is that of one the characters witnessing the brewing mutiny in Bharata, somehow Kenyon didn't manage to make any of them, on both sides of the conflict, particularly engaging. The pace is also an issue from time to time. Too slow in certain portions of the novel, while rushed in others. The culmination of the storylines dealing with the search for the mysterious lotus flower is decidedly anticlimactic and subsequently sort of kills the rest of the tale. The resolution takes too much time to transpire, and both the build-up and the ending fail to cap off the book with the sort of aplomb needed to bring everything to a satisfying ending. The underlying themes of sexism and the emancipation of women were not explored with enough depth to truly flesh out Tori, something that would have added another dimension to this work. In addition, the often heavy-handed anti-colonialism/anti-imperialism spiel can be irritating. Had it been woven seamlessly within the tale itself, it would likely have worked much better in the greater scheme of things. All in all, A Thousand Perfect Things is a good read, but nowhere near as fun and fascinating as the four volumes which comprise The Entire and the Rose. The "Entire" and the Rose? Proofread.